Soldiers from the 902nd Engineer Construction Company, 15th Engineer Battalion repair construction elements just hours after a devastating storm ripped through much of Rose Barracks and the Grafenwoehr Training Area. The storm shocked community members into swift action in what also emerged as a spirited testament to the garrison’s equipped readiness and strong network of community partnerships. GRAFENWOEHR, Germany — An unusually devastating storm blew through the Rose Barracks community of U.S. Army Garrison Bavaria last Thursday, shocking community members into swift action in what also emerged as a spirited testament to the garrison’s equipped readiness and strong network of community partnerships. Weather forecasters from Detachment 2, 7th Weather Squadron at Tower Barracks sent routine alerts to the garrison installation operations center, the 24/7-run epicenter of garrison operations, early Thursday afternoon warning staff of severe evening weather formations for Tower Barracks, Rose Barracks and the outlying areas. As the clock approached midnight, the late-summer thunderstorm moved into an area where conditions forced the storm into a sudden collapse, creating destructive downdrafts — what meteorologists call “microbursts” — just over Rose Barracks and the Grafenwoehr Training Area, said Air Force Cpt. Mitch Westlund, Detachment 2, 7th Weather Squadron. “Microbursts can get up to 120 miles per hour and essentially have the same effects as a tornado, but going the opposite direction: everything is going out, instead of going in,” Westlund said. Following the devastating storm, garrison leaders called in a crisis action team of experts from emergency and mission-essential directorates to assess the extent of damages and initiate a community-wide cleanup effort rooted in restoring installation security and ensuring the safety of all community members, said USAG Bavaria Deputy to the Garrison Commander Annette Evans. Emergency crews and repairmen from the garrison public works division were on the scene just after 2 a.m., clearing emergency access routes and addressing urgent repairs that pose immediate threats to community safety, said Lt. Col. William Burden, emergency services director, USAG Bavaria. The first responders prioritized surging water pipes, trees limbs hanging over homes and public spaces, and broken live power lines in neighborhoods. It was not just garrison employees who were quick to respond. Before dawn, members of the German Forestry Office, a host nation organization that helps maintain pristine natural habitats for native species in the Grafenwoehr Training Area and throughout Germany, were out in boots and rain jackets trudging alongside DPW crews through mud and dashing into damage zones to reduce danger and assist with the massive cleanup effort. In its most severe formation, the unpredicted microburst tore hundreds of trees to pieces, leaving vast stretches of aging forest mowed down. 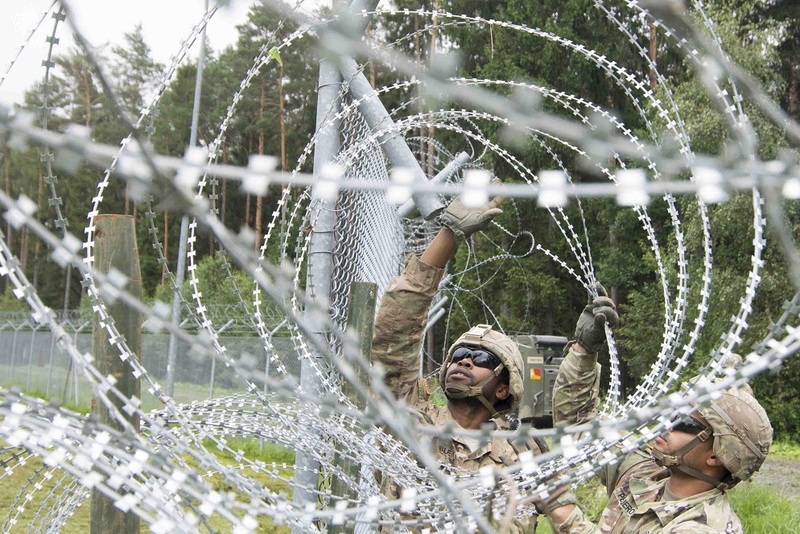 Platoons from the 15th Engineering Battalion were called to make acute repairs at various locations with the most immediate risk to installation security, said Varney. The group of Soldiers, who spent the storm bunkered in tents for a field exercise, arrived the next morning around 9 a.m. and completed all repair work by mid-afternoon. The sites — closely resembling the stunning aftermath of a tornado from the American mid-west — were toppled with century-old pines, each weighing about a thousand pounds, said Sgt. Joseph Worrall, squad leader, 3rd Platoon, 902nd Engineer Construction Company, 15th En. Bn., who lead the engineering response team. “At first, we didn’t think it was much work, but when we started getting into it and looked down the line, we were all like oh man that’s crazy. That’s a lot of damage,” said Spc. Justin Foote, carpenter, 3rd Platoon, 902nd ECC, 15th En. Bn. Storms like these are very difficult to predict, Westlund said. When the right ingredients are present, they occur almost instantly and can last up to several minutes. Fortunately, he added, they are very rare for Bavaria. Garrison leaders anticipate an extended cleanup effort with projects stretching into the next several months. The ongoing effort will address minor, less urgent work orders and rehabilitate forests demolished by storm’s rampage, Varney said. Varney also added that the cleanup effort will continue to be one built on collaboration with garrison partners, a lasting tradition at USAG Bavaria. “From the initial response and getting things back to where they need to be — making sure life and safety concerns are where the need to be — to now, the longer cleanup phase, I think is a great example of how one community can pitch in and help do the right thing,” he said. As they worked alongside Germans from DPW, Soldiers on the ground recognized the significance of their impact on community safety and how it plays a role in continuing USAG Bavaria’s legacy of enduring and cooperative partnerships.